Maybe we've been wrong about Nintendo. Maybe we've been wrong to be thinking in terms of Nintendo vs. Apple or Nintendo vs. Microsoft or Sony. Maybe we've even been wrong to think Nintendo's big thing this fall is a new console. After I interviewed Nintendo president Satoru Iwata last week, I'm thinking that the angle I've been missing—the angle almost no one has been talking about—is that Nintendo sounds like they want to create a gamer's version of Facebook. Forget talking about the 3DS XL as a counter to the next iPhone, the Wii U as an iPad or Xbox competitor. The biggest story just might be that Nintendo wants to make a social network, bake that into their next console, eventually add it to their 3DS, and basically change the way gamers (read: Nintendo customers) connect to each other. "I feel that we need to create—or present—a gaming platform as the place to create that 'social graph' for folks who are in gaming circles," Iwata said as he began to describe to me Nintendo's ambitions for an online service called Miiverse that will launch on Nintendo's new console and eventually spread to the company's 3DS handheld as well. A "social graph?" This will require some explanation. All of this Nintendo-social-network stuff came upon me by accident. I was chatting with Iwata at Nintendo's San Francisco-area offices about Nintendo's new 3DS XL and their latest Mario game. We were running out of time and I remembered an intriguing comment Iwata had made in a pre-recorded video address before the E3 show in June about how the company was going to start an online service called Miiverse for this fall's new Wii U console and how this new service would, among other things, increase gamers' sense of "empathy" for each other. Iwata: "We have reached an era where even a single-player game experience [can] have a social component that is very important. And I think, again, that social component is mandatory."" Online gaming can be a hostile place. If gamers could be more empathetic, that would be great. Since E3, I had assumed that is what he was getting at. I remembered this as we chatted and as I looked at the 3DS XL I'd placed between me and Iwata. I thought about one of my favorite features of the 3DS, how a small green indicator lights up when my system is near someone else's 3DS system as the two machines wirelessly and automatically trade greetings between me and the other machine's owner and how those little "Street Pass" connections turn out to be delightful discoveries when I remove my 3DS from my bag and see the green light glowing. It makes me feel good about other gamers; maybe even empathetic. So I mistakenly asked Iwata if he was hoping that Nintendo could reduce the hostility in online gaming. I thought that's what that was all about: a positive twist by Nintendo applied to some commonly unpleasant systems of online play. I was way off, probably because I was thinking about what Nintendo is doing in the context of Microsoft's Xbox Live, that popular service that is just chock full of nasty gamers who have no empathy for each other. Iwata's reply seemed to have as little to do with Xbox Live as it had much to do with Facebook and with Nintendo forming a new Nintendo-style social network on its consoles and handheds. But he got there in an unconventional way. "We have reached an era where even a single-player game experience [can] have a social component that is very important," he said, skipping past any talk about Street Pass lights and going to the big picture. "And I think, again, that social component is mandatory." "Of course the Internet does provide a lot of that interaction," he continued, "but it's not built for that purpose. For example, Facebook is something that connects you socially with a lot of different folks, but that doesn't guarantee that the people you are going to have interactions with via Facebook are interested in games. And what I'm saying is that I don't believe that the life experiences that you have—and those might be with the people you are connected with on Facebook—are not equal to the gaming experiences you might have with a lot of different folks." Iwata tends to talk in double-negatives. At least that's how they come through in translation. So let's take "I don't believe that the life experiences that you have...are not equal to the gaming experiences you might have with a lot of different folks." and re-write/read it as him saying that the experiences in our gaming life are as important as the experiences in our non-gaming life, that our experiences adventuring through a game world or leaning on each other for help in games are as consequential to our lives as a lot of the non-gaming stuff we might post on Facebook. "I feel that we need to create—or present—a gaming platform as the place to create that 'social graph' for folks who are in gaming circles, I guess. So that's kind of the reason for creating Miiverse." All for a system that is designed to be more social. So we've got Nintendo trying to make something that really doesn't sound a whole lot like Xbox Live, which makes sense, since Xbox Live is fairly archaic. When Xbox Live was re-introduced for Xbox 360 in 2005, it was a cutting-edge service for online gaming. But today it amounts to little more than a marketplace linked to a competitive gaming service, a provider for basic voice chat, text chat, user parties, and a 100-person friend limit. That's all closer to the blunt edge, compared to ever-evolving social networks like Facebook. Microsoft will get their shot to re-do Xbox Live for their next console next year, but Nintendo gets to move things forward with Miiverse. Back to Iwata: "When we looked at the timing of how we are going to be implementing it, [we said], 'Okay, when are the best points when people want to have social interactions and makes them want to reach out and say, "Me too," "I did that," "I feel the same way,"?' I think, on a very human level, that is what will give them a sense of satisfaction. Iwata: "Of course we're going to have that service of head-to-head [multiplayer].. . but what we really want to do is create a place where folks who are playing by themselves will not feel like they are playing by themselves." "If you look at gaming services, for example if you look at Xbox Live, one of the more traditionally or generally accepted features of the gaming service is the ability to play with folks at different locations at the same time," he said. "On the other hand, you're not always going to be available at the same time to play with each other. And of course we're going to have that service of head-to-head [multiplayer, when you are] on at the same time playing games against each other, but what we really want to do is create a place where folks who are playing by themselves will not feel like they are playing by themselves. They'll be able to share those experiences and have that empathy that we mentioned earlier." Nintendo will talk more about their online service in the future, as it's obvious this is a complex plan, one that will debut on their next console, spread to their handhelds and go who knows where else. "We will be making announcements as we are talking more about specific software and we'll ask you to wait for those announcements of how we are implementing it with those software titles," Iwata said. For now, we're left to ponder what Nintendo can pull off. Expectations should be kept in check, of course. This is Nintendo. This isn't a company known for leading in online gaming. But they are a company that's been able to bring gamers together in unexpected ways. They did it back in the day with Mario Kart and again with Wii Sports. Their online offerings have gradually improved, though the late launch for the 3DS' eShop revealed them to be a company that's yet to make their online services as high a priority as the launch of their consoles. Consider this: back in 2006, the know-it-alls in the press, myself included, thought that the Wii was Nintendo's big thing, and by "Wii" I mean "Wii Sports" and the controller and the unassuming little white box that ran the game. What no one was talking about then until we got it in our homes were the Miis, those little avatars that everyone who touched the Wii just had to create and tweak for themselves. These little avatars, like Microsoft's Achievements, proved to be one of the smartest innovations in this past console generation. They just weren't the ones whose impact we saw coming. We didn't see the brilliance of them until they were live and changing gaming as we knew it. 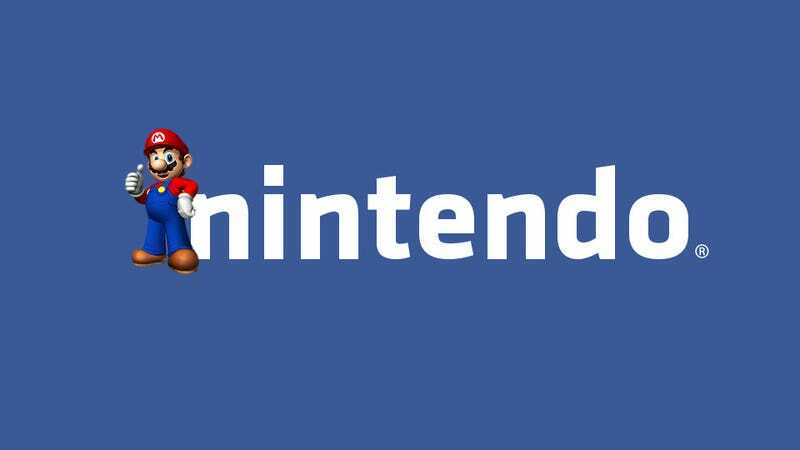 If Nintendo creates a gaming version of Facebook and bakes it into our consoles and handheld, well, then maybe they'll be able to stealthily transform what we expect from console gaming all over again.